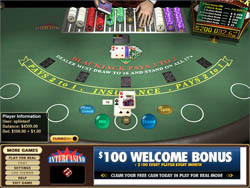 The dealer will stand on every 17 hand in this game of Progressive Blackjack, so you can always get a good idea whether you should hit or stand. If you wish to split your paired hand you may do so just once, since you are not allowed to re-split. Split aces take just one more card each, and if that card happens to be worth 10 points, the hand is counted as 21, not as blackjack. You may double down on any cards, even after you split, for a wager equal to your initial bet. If the dealer shows an ace you can purchase Insurance for an amount equal to one half of your original bet. There is no option to surrender in this game, so you must play out every hand you start. You may wager as little as 1 or as much as 500 USD/Euro/GBP in Progressive Blackjack. Bets are made using chips, which come in five different sizes – 1, 5, 25, 100, and 500 – which is handy if you want to bet 162 or 34 on a hand. After all the betting is finished and you’ve played your hand, hopefully you beat the dealer, since that is the point of the game. If you did, you are paid as follows: blackjack, 3:2; insurance, 2:1, standard sin, 1:1. All bets push on a tie. In addition to these standard payouts, Bonus Progressive Payouts are available if you choose to wager a single credit as a side bet at the start of your hand. These payouts are enabled when you have certain combinations of aces in your hand. Payouts are in whatever currency you are using to play. The graphics in Progressive Blackjack will knock your socks off. They are fully 3D and animated, and are as real as you can get with computers these days. You do pay for this in gameplay, which can be a bit frustrating because the cards and chips are smallish, but if that does not bother you – and it probably won’t after you see the game – then play on! The interface is standard, and there is a Turbo button to speed things up a bit if you don’t like to wait. You can even turn off the animations, but what fun is that? Cryptologic’s version of Progressive Blackjack has the best payouts of any such blackjack game, and its realistic, fully-animated 3D graphics blow the competition out of the water. Plus it has high limits, so if you’re in the money, you can bet it all! As fun as this game is, it’s hard not to play all the time – you have been warned!